I am a BI and Analytics professional trying to learn something new every day. I am also a wife, mother and community member in the Greater Boston area, all of these are other areas where I learn something new all the time. For those who will read old posts, my original plan was to document a series of hikes with my family - especially with my daughter. We never did all of the 4,000 footers in NH, but we've had many wonderful hikes since I originally setup this blog 8 years ago. I joined SEI's Boston Group this week to become part of this strong local consulting firm and its fabulous culture that operates in a variety of industries and areas of specialization with IT. It wasn't easy to leave my friends and respected colleagues at Pragmatic Works, and I look forward to working with them again in the future. Here on my blog I will continue to share what I learn. I fully expect to be learning at least as fast this year than I did last, so hold on here we go! If you are looking for any IT assistance, please check out our capabilities. 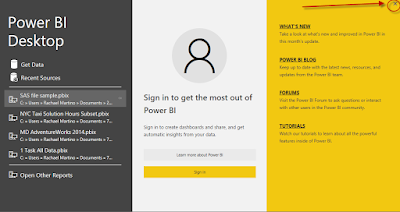 Answers to some common questions and frustrations for new users of Power BI. I'd like to help save you some time banging your head and searching the internet by pointing out some of the issues I've run into when working with clients over the last year. 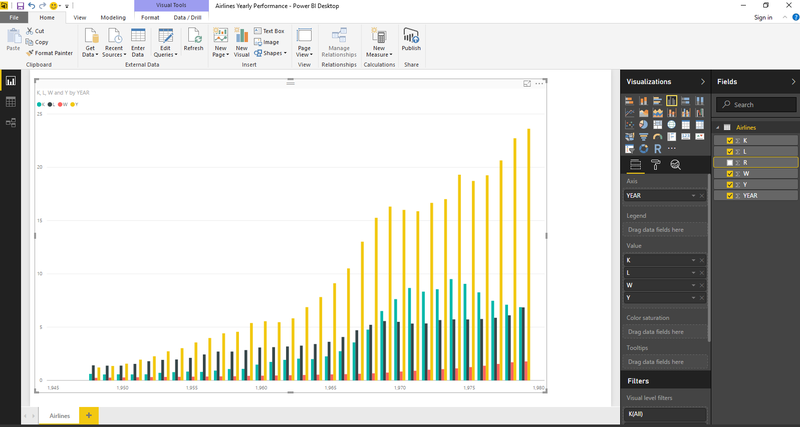 There are many articles and blogs about the technical aspects of loading data into Power BI so I won't cover that here in great detail. However, I would like to call out some basic data transformations and cleansing activities that can make a big difference to the experience of report users. 1. Rename your data columns to use business terminology in the field names. This isn't a database, this is a reporting data model and your business users need to be able to understand the names of the columns. 2. Add units to your column names. Again, the objective here is to make the reports readable and easy to interpret. You don't want your uses to wonder if you were summing minutes or seconds in the reporting graphic. Will the column be used for reporting? Really think about this, will the users of your reports NEED to see this column, slice or filter by it? If not, it doesn't belong in your reporting data model. Will the RECORDS in your table all be reported on? Again, every record might not have valid data. Check for this and remove records that are not going to provide good insight in your reporting. 5. Remove unused records, even from date tables! Are the records part of the data set you need? Sometimes we load records that go all the way back years before our reporting range. Unless those records contribute to the value of information shown in the report, remove them. This is ESPECIALLY true of the Date or Calendar tables - think about those extra records. This is much more data than you need to be filtering through for your reports and interactive visualizations. Change data types to be accurate for your business definition of the column. 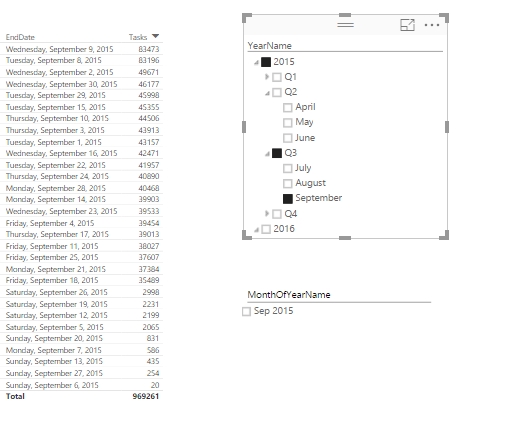 Sometimes colums will come in as whole numbers to Power BI because the sample used to define the column "sees" only numbers in the first 1,000 rows for the preview. If this is a text based column, your data load will error when you load the rest of the data. 7. Use Trim if you think there might be leading or training spaces in your data. These are similar: that the engine will calculate them for you, and both can be aggregated in your reports and visualizations. The key difference is that calculations are values that are stored in each row of your table, and measures are not calculated until used in the report context. Often you will be told to use custom calculations instead of the default summarization on your columns. 1. You will then know, and be able to define in a data dictionary, exactly how the calculation was built. 2. However, if you do use default summarization, there will be a benefit when viewing reports: you will be able to use the "View records" command to see what records were included in the aggregate. This does not work for measures. You might need to know the maximum Amount which is max(Quantity * Price), but when reviewed across all rows for orders placed within the current Year it will give a different answer than when viewed for all orders within a given City. It is easier to do all of these steps for all of your columns at one time so that your reports look great from the start and you will know that the standard has been implemented. It is still likely that you will need to return to update or fix some which you can do a t any time. You can categorize your records automatically by creating groups that become a new column in your table. 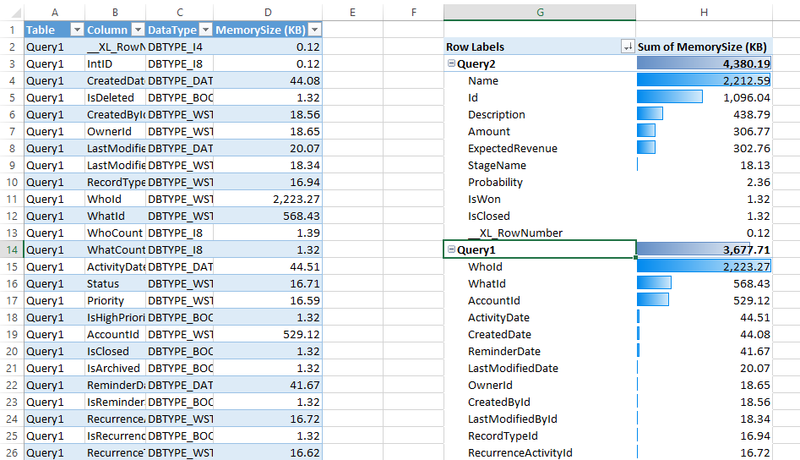 "Other" as a category allows for new data values added in your incoming data. Be sure to check overtime that you don't need to add a new category though. i. Creating a hierarchy is something people do accidentally all of the time, then they worry about damaging their data model by deleting them. Don't worry if you get an accidental hierarchy with an unintended drag/drop of a column in the Fields list, just go ahead and delete that hierarchy - your fields will stay as they were. ii. To create an intentional hierarchy drag a lower level field over to the highest level in the hierarchy and drop it there. There will be a yellow dotted line shown where it will drop. Each other column added to the "pile" will be added at the bottom. iii. If necessary rearrange them by dragging them up or down, or delete one using the "x" to the far right. iv. Adding a Hierarchy to the axis of a visualization will enable drop down. v. In the axis of a graph - you can remove levels of hierarchy that are not desired for that graph without any effect on the hierarchy. 5. You can now "See Data" AND "See Records"
i. See Data will show the values that are in the visualization - as a table. ii. See Records will show the table records that comprise the aggregations that are shown in the graph. Every record in it's entirety. iv. Trick - if you want a count as your visual value, but your data doesn't have a uniquely identifying column to "count", create a column that can be summarized for the counting (like "Trips") and default it to the value of 1. You can then sum or count the values in this column to know how many unique "trips". 6. If you create a visualization (a bar chart) and the values are the same in every data point you have probably forgotten to create your relationships. You can draw them on the Relationships tab, or us the Manage Relationships dialog box from the Home ribbon bar. i. Single direction filtering enables the value from one slicer or visual to affect the values on the related table. However, filtering the second table by another value will not affect the values shown from the slicer. ii. The best way to visualize this is to see 2 slicers from two dimensional tables and when the dimensions are both single direction, the two slicers will not affect each other. iii. If the 2 dimensions are "Both" direction filtering, then selecting a value from one will affect the values shown from the other. ii. The single down arrow button is a toggle to turn drill down on, when on selecting a value in the chart will "drill down" to the next level. i. Ex: if you go from showing 3 years down to months, you will see the values for each month of every year. i. Joins with the date table must be made on the date column - NOT on a surrogate key. ii. The values in the time calculation must also be continuous. If you are aggregating ParallelPeriod values, you must be doing it across a dataset that has a value for every date in the time period. 11. Why isn't my calculation working? These are some of the "gotchas" that can waste your time when you create your reports and can cause your users confusion when they use your reports. Are there others that you've spent time resolving that you'd like to share? 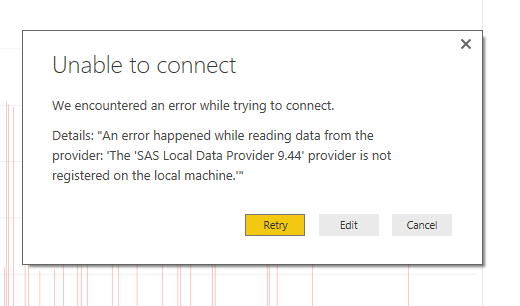 Recently I have been working to read SAS files (sas7bdat file format) in Power BI. SAS technical support and the Power BI community team have both worked with me to attempt to use the SAS Local Provider for OLE DB which is the only provider that does not require a SAS server. We were able to use the SAS Local Data Provider 9.44 in Excel by using the Data Connection Wizard to access Data Link Properties and to read the sas7bdat data into Excel as a data source (see details on this at the bottom of this post). Text of error: "The 'SAS Local Data Provider 9.44' provider is not registered on the local machine." Now, this error seems actionable until you remember that we just used the provider to connect from Excel. This is due to the use of the GetOleDbSchemaTable method and we could not find a way to work around this problem in Power BI. I have submitted this as a support ticket to Microsof and I look forward to their response on how to get a supported connection to SAS files. d. Select to Load the data directly, or Edit to use the Query Editor to filter, clean, reformat or otherwise transform the data for this and all future data loads. I am very interested to know what the results are using production size and complex datasets, and am willing to help in anyway that I can if you have questions about using this method. The Power BI solution can be published to http://app.Powerbi.com using the Publish button. The R Script has imported the dataset, so that will be published to the Power BI Service along with the reports. The elements of analytics are the same whether on premises or in the cloud. Cloud based tools for analytics can provide a platform that is far more extensible, economical and powerful than traditional on-premise. This session will review some cloud analytics use cases and how the tools from Microsoft combine to create business insight and value. 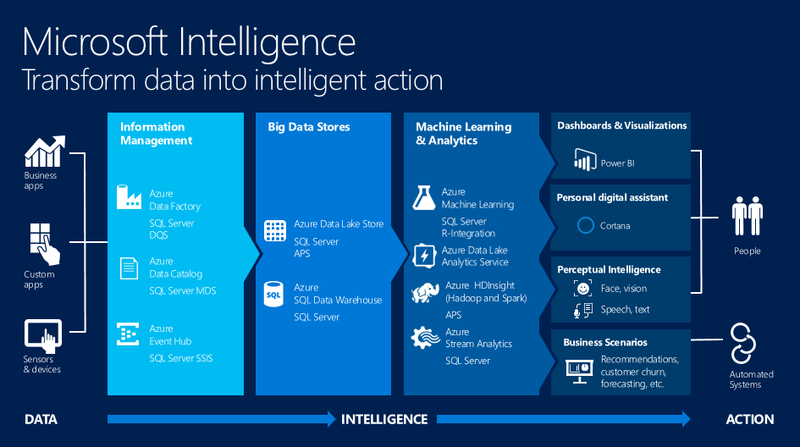 Microsoft Intelligence (edited, previously Cortana Intelligence Suite) is a powerful combination of cloud based tools that manage data, provide analysis capability and store or visualize results. Together these tools represent the six elements of data analytics. 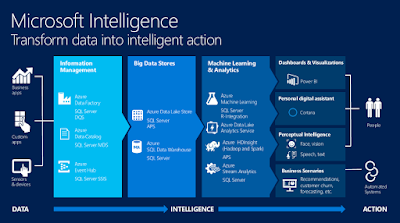 The talk on Data Based analytics includes a demonstration of Data Lake, PolyBase, Azure SQL Data Warehouse, Power BI, and Azure Machine Learning. The links to Power BI and Azure ML will take you to the apps, each has a free account you can sign up and use for testing. I encourage you to sign up for the free offer for $200 in Azure Credits (United States based offer, at the time of this posting Oct. 11, 2016). Tools provided by cloud vendors provide assistance and in some cases, with far superior solutions to these issues. How can my business benefit from analytics in the cloud? Data, provided and used as a valuable asset of the firm provides leverage employees apply to problem solving activities. 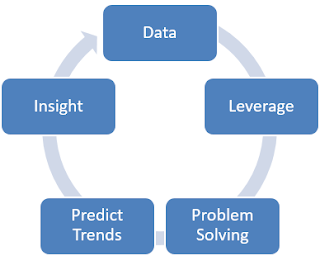 Fact based trend prediction leads to insights that provide business value. Businesses taking advantage of the cloud to benefit from increased cloud computing power, the ability to handle large data sets and for the mobility provided by access to the analytics platform from any location. Power BI brings many customers their first exposure to cloud analytics. Companies find multiple benefits of collaboration between users, mobile access, and the experience of adopting a new way to use data. Workspaces provide secure areas to work together on Power BI solutions and are linked to Exchange groups and OneDrive folders where other collateral can be shared. Using Azure cloud based storage is relatively inexpensive, remotely accessible from anywhere, secure and in coming data is free (data moving out of your region is charged). Large data sets can be managed in Azure Blob Storage, Azure Data Lake, Azure SQL DW and Azure SQL Database. Azure ML provides a friendly tool for building machine learning experiments, cleaning and visualizing data. The environment provides familiar analytic tools for R and Python scripting, built in models for statistical analysis and a process for encapsulating trained models in web services as predictive experiments. Integration with Excel and other applications is simplified by the web service interface. Q1) In the PolyBase example does modeling the data by casting columns hinder performance of the data load in the "Create Table As" (CTAS) statement? In creating the External Table the columns must be of the same data type. However, when querying the external table to use CTAS to populate a SQL DW table I found that using cast to change the datatype of the column was faster to complete the new table creation. This was true for two cases, one where I converted in the input column varchar2(20) to an Int and another where I converted the input varchar(100) to a Date data type. I suspect this is due to the increased speed of input for Int and Date data types over varchars, but it indicates that the original query time isn't different. Q2) Is it simple to switch from cold to hot in Azure Blob Storage? In regions where these settings have been enabled (not East yet), they can be changed in the Configuration blade of the Storage Account. Q3) When to use Data Lake in comparison to Blob Storage. In the demo for this talk I read the NYC 2013 Taxi data from the 12 - 2+GB CSV files into Azure SQL DW using CTAS. At this time, Data Lake is still in preview, and we cannot yet use CTAS with Azure Data Lake. This forced me to use Azure Blob Storage. Additoinal differences are that Data Lake is optimized for parallel analytics workloads and for high throughput and IOPS. Where Blob Storage is not optimized for analytics but is designed to hold any type of file. Data Lake will hold unlimited data and Blob Storage is limited to 500TB. There are cost differences too, I recommend the Azure Pricing Calculator. I recommend the Microsoft article Comparing Azure Data Lake Store and Azure Blob Storage for details. Back in March of this year I created an article and a webinar for the Pragmatic Works Blog. 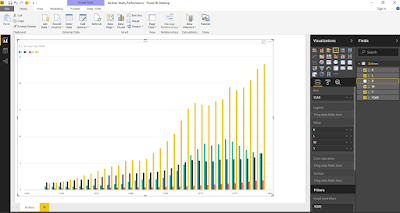 The original concepts still hold, Power BI and Excel Power Query are very powerful tools for building data models and sharing data discovery and visualizations. As you move from initial prototyping to a more mature model you may find that performance can be bogged down if you don't manage the structure of your reporting information. This talk provides Tips and Techniques to manage this information (link to updated slides). Since the original webinar I have presented this topic at a few user groups and SQL Saturdays and was asked some very good questions. I'd like to answer these questions here, and to update the slide deck as well. 1) In Providence at the BI User Group I was asked: What happens in Kasper de Jonge's Memory Usage Tool macro when there is a join between two queries loaded into the model? If the join is done in the data load, the data model contains only one table, as in the example discussed in the original presentation. 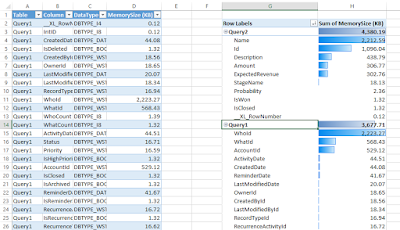 If there is a relationship created between two tables loaded in to memory, the joined tables are both shown in the pivot tables that result from the macro, and how much memory taken by each column is shown as a datatype and total for the column. 2) In NYC at the Power BI User Group a member asked: Does the HierarchySlicer cause performance problems? To test this, I used a data table with nearly 14M rows linked to a Date table. 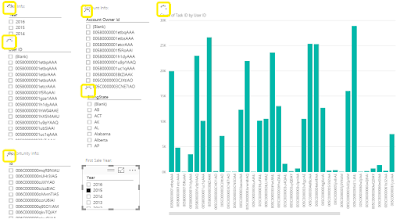 Power BI connected via direct query to SQL Server 2016. The Hierarchy Slicer (HierarchySlicer.0.7.9.pbiviz) at Year / Month on the Date table compared to a "flat" YearMonthName non hierarchical slicer. In this case, each new slicer selection took about 2 seconds to repopulate the summary table to the left. The two took the same amount of time, I did not see a difference in performance. 3) At SQL Saturday in Dallas this question came up: Is the SSAS formula engine still single threaded in Power BI on the portal as it is on the desktop? 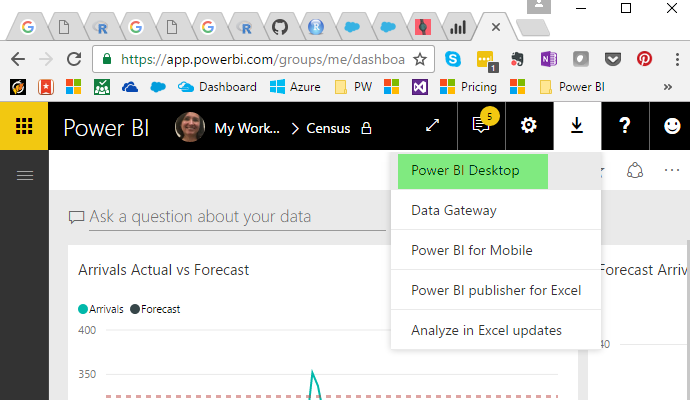 The SSAS engine is the same in Power BI on app.powerBI.com as it is on your local drive. There would not be an improvement on calculations caused by multi-threading, although the local machine may or may not have more resources to dedicate to the formula engine thread. Thank you all for the great questions, please comment on others questions or if you have more information! World Class Data Organizations (WCDO) intentionally invest in and build their data cultures to create business value. These businesses integrate data into daily activities beyond report or dashboard reviews. Employees know what data elements represent, how to access them, and how to use them to create new insights. WCDO and SQL Server 2016 (pdf) presents the primary characteristics and activities of WCDO's and expands on some of the features of SQL Server 2016 designed to enable those activities. This is the slide deck presented on June 30, 2016, and the beginning of a series of presentations I will deliver on this topic. #1 Dashboards are "a single place to monitor the current state of the data". Readers will drill down for detailed information, the dashboard should provide high level information, showing what performance indicators require the user's attention. Make the most important information the biggest on the page and provide context, including units. For example: show a KPI visual with trend and current value. Put the most important items in the upper corner where your users will start reading. Consider the visualization and select those that tell the story in the data. The Microsoft support article includes a great group of references on design including writings of Stephen Few and Edward Tufte. Dustin Ryan points out a nice technique of using visualization elements as navigation (at time 47:23 in the video) as they interact with other visuals in a report. #2 Design for the user's reporting needs. Like Delora Bradish's exhortation to always consider reporting when designing your data warehouse, your data model should provide friendly table and column names that reflect familiar business terms well understood by the system's users. Include only necessary data and hide any information that might be used for creating the data model or calculations but not shown (like key values) in reports. #3 Design your data model to support self-service. Double check relationships in your data model to ensure that self service reporting will return valid data. Carefully specify check data types and how or whether fields should be summarized. Separate unrelated data into multiple tables to clarify reporting. Use star schema when possible, as snowflakes can limit scalability. Use snowflakes when lookup tables can provide usability improvements without performance implications. #4 Consider security and data refresh early in the design of your project. Work with appropriate administrators, whether in Security or your DBA's, to build gateways for data refresh or direct query access from on premises data sources to the Power BI portal. Schedule refreshes to correspond with your data frequency, there is no reason to update data eight times a day if it is loaded weekly. 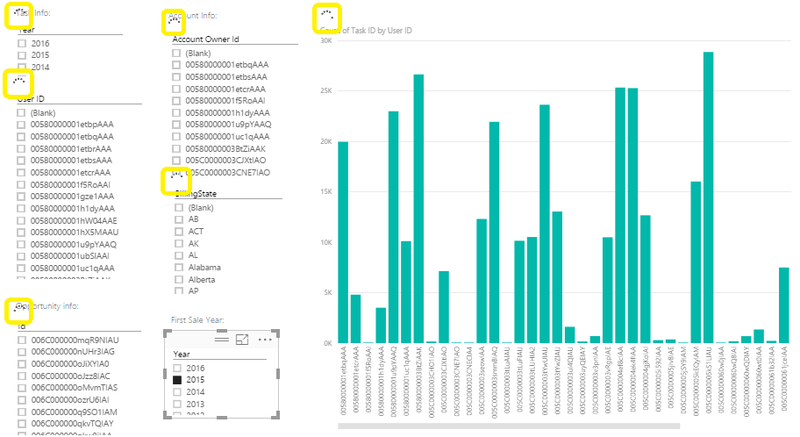 #5 Take advantage of Power BI Content Packs internally and to access services. Use organizational Content Packs to provide read-only pre-built solutions to your organization or other groups. Members of the group can copy these and personalize them as needed. Use Content Packs for services published for many common business services. 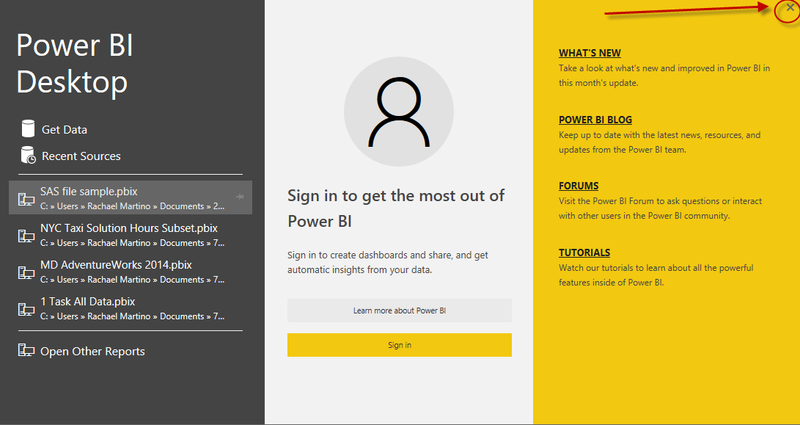 Use this link to see available content packs from the Power BI portal. #6 Configure your solution to maximize Q&A Natural Language capabilities. "Datasets not represented with tiles are not considered, anticipate the types of question that may be asked and design the dashboard with tiles from datasets which may respond to sure questions". Questions will join entities to provide answers (example sales and fiscal calendar to answer a question about "Last year's sales revenue"). Be sure to fix data types so that Q&A can correctly represent the answers. Be sure to mark those that should not be aggregated with do not summarize. Add data categories wherever possible. Put your topics in their own datasets, break out each topic from a given entity. Add synonyms to improve Natural Language capabilities of PBI on your data set. #7 Be wary of performance issues that might affect your data model's performance. Tall, narrow tables are faster than wide tables with many columns, especially if the columns are highly unique (columns that are highly unique are said to exhibit "high cardinality"). Use integer keys for primary/foreign key relationships. Reduce uniqueness in columns by splitting date and time values, and by reducing the "granularity" of time to hours if that is required for reporting. Please comment on my choices, or add your own best practices to this growing list. The first post in this short series addresses strategic concerns for developing BI projects. Here we are, the before image! A mother, a wife and a an engineer working in the data world.